It’s time to look at the new Creed film. While boxing movies may have never become a huge genre, it was always one where you could immediately think of 5 films. That’s because the Rocky series exists. It set a really high bar for the genre so then when it left you couldn’t help but miss it. When the first Creed film came out it worked as a nice sequel to the franchise. Now we could finally see a whole new generation of fights. While I believe the first film holds the slight edge, this movie does a good job of staying on the same level and certainly delivers with the fights. The movie starts with Adonis claiming the heavyweight title from another guy. He is now the world champ and has begun to settle into his role as a master. He and Bianca are starting a family and things are going well until Viktor shows up. He is the son of Ivan Drago, the guy who murdered Adonis’ father. Naturally Adonis has a hard time trying to refuse Viktor’s challenge and decides to get into the ring once more. The problem is that Adonis is a quick fighter, but his hits don’t land a lot of damage. If he isn’t careful then it’s going to be all over. He has nothing to gain while Viktor has nothing to lose. From the start of the film’s trailers and plot summaries I was a bit dubious about Adonis’ decision to fight. Of course it’s all very personal to him of course and he brings up the fact that Rocky essentially did the same thing, but it was a little different. In Rocky’s defense, Ivan murdered Apollo right in front of him so he had to get in there and avenge him. In this case, it’s all behind Adonis, but he just wants to prove that he can win where Apollo did not. Adonis can bring honor back into his family name. He trains and everything so it’s not like he walks into the match blind, but I do think it certainly wasn’t a great call on his part. If you gotta take the fight then take it, but don’t block everyone out in the mean time. Adonis even pushes Bianca away for a while during this period. By the end of the film Adonis has realized once more what is really important and effectively ends his character arc..until the sequel. While he may have had a few rough patches I would still say that he is a pretty solid main character to root for. Meanwhile Bianca has her music plot although it doesn’t get a whole lot of screen time in this installment. From what is shown we can tell that Bianca is doing quite well though. I’m glad the film didn’t try to go for the “Adonis is jealous” route here as that would have been petty. Adonis is certainly not that kind of character. Bianca’s definitely a solid heroine and it looks like her career will keep going on in the next film as well. I don’t know how long the shelf life for a boxer is but there’s a good chance she will outlast him. Viktor is the main villain here and he definitely looks a lot stronger than the guy from the last film. In fact, the film makes him look so powerful that you may have a tough time believing that Adonis can hold his own at all. The guy is just way too strong and Adonis’ hits don’t have nearly as much weight. There’s not much to Viktor aside from being the villain here, but I’d say that this works pretty well. All you really need to know about Viktor is that he wants to win to please his father so naturally his drive is very strong. At the same time he definitely fights dirty so I don’t think you will be forgetting that he is the villain anytime soon. Rocky still serves as the main mentor role here and does a good job in it. His fighting days are certainly gone, but he’s still an excellent coach because of his experience both in and out of the ring. Since he overcame the health problems in the first film they aren’t a concern this time around. While it would be nice to see him fight as a homage to the old films it isn’t all that realistic because of how old he is. When Ivan shows up you get the feeling that the guy can still fight, but Rocky is certainly not in a condition to do so. He still gets the good one liners in though. Meanwhile Ivan is a pretty solid villain like Viktor. His only failing I’d say is that the guy puts way too much stock in trying to impress the Russians. He really shouldn’t care after they abandoned him. I suppose his national pride blinded the guy until the end. Sort of a side note, but it was nice to see Max here. He’s always pretty fun on ESPN First Take so seeing him here was pretty surreal. If anything it made the boxing matches feel a lot more realistic and legit here compared to previous films. The movie does a good job of making you feel every blow. You can instantly tell which shots had glancing damage and which ones really made the character feel it. For the big comeback punches you’ll have the slow-mo feature at the ready. I’m sure that a big reason why you will be watching this film at the end of the day is for the fights so they do deliver. As for the soundtrack, that one is definitely a step below the classic Rocky films. The new tracks just aren’t nearly as inspirational. They don’t make you feel like it’s time for the hero to take down the opponents and save the day. They may be fast paced tunes, but I can’t say that the lyrics seem all that great. Even the script can be a bit weaker than the old films as it has a bit more language. Nothing too bad, but still just enough that it can be a bit noticeable. If there is any other weak aspect of the film it is definitely the romance. It did take up quite a bit of time and I think the first film already had that plot completed. The extra drama we got here could feel forced at times. It seems to be resolved though so I’m assuming that for the third film it won’t really be a factor. I’m still wondering what that film will be about, but I’m betting that somebody arrives to challenge Adonis. It would just make sense right? 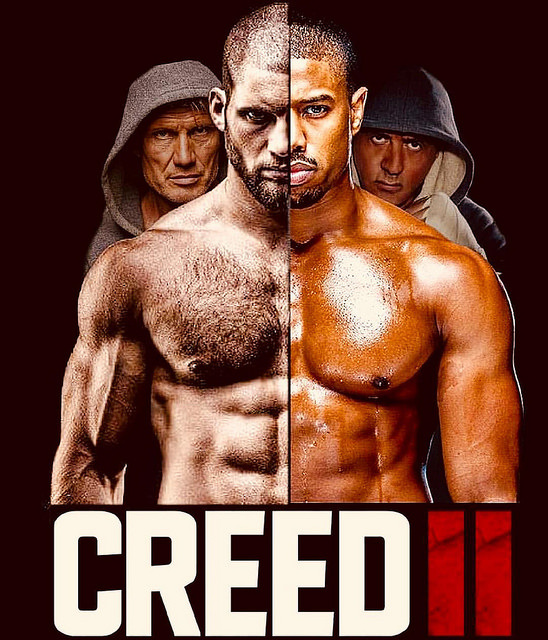 Overall, Creed II is a solid boxing movie and works as a good sequel to the first Creed. It’s got everything you would want to see in this film. It’s reasonably long with solid pacing so it never feels like it is being dragged out. The main cast of characters are all rather solid. If the film intends to redeem Ivan and Viktor by the end I have to say that they still have a lot of work to do. I still consider both to be villains. While Adonis may not have looked quite as good as in the first film I think he’ll be back at his best for the third film. I hope they get Max to sign on for the third film as well since his insight is always appreciated. Of course, throwing in Skip Bayless or Stephen A. Smith would also be exciting. If you haven’t seen this film yet then I would definitely recommend doing so. I saw this film quite a while ago when it first came out so this review has been on the shelf for a while. Well, no longer! It’s time to discuss this film, what it did right and what it did wrong. I can say now though that Creed did live up to my expectations for the most part. It’s a fun film and I liked some of the modern twists that the film added to the franchise. Conversely, there were some modernizations that didn’t turn out so good. Rocky lived up to the hype as being the best character in the film by far and it’s good to see him get his props. To think…I started this review in November, but it was placed on the backlog for a very long time. That’s how it goes I suppose, but let’s wrap this up. Adonis has had a troubled past and is no stranger to being in fights. He is eventually adopted and treated to a very luxurious life. He even gets a nice financial job with a lot of money, but it’s not enough for the guy. Adonis wants to fight so he quits his job and gambles away his car on a match where he is soundly defeated. The main character was forced to move into a very small apartment building, but also decides to meet up with Rocky. Rocky is reluctant to train the kid, but eventually relents and now Adonis must work to become the strongest fighter of all time! Well, let’s talk about one of the modernized techniques that I did like a lot. Whenever a fighter would walk into the ring, the screen would quickly freeze and show off the guy’s rankings. It was like a little power level system that you would expect to see in a Shonen Jump crossover film or something like that. It was definitely a lot of fun and I hope that they keep this in for the sequel. It’s the little effects like this that can really amp a film up. Unfortunately, another effect of modernization is that there is definitely more language to be found here than in the original. It can definitely get a little tired. The boxing matches are solid as you would expect. They’re not as good as the original Rocky films, but few fights are right? They can be a little violent with one random blood scene, but they’re still relatively tame when compared to the average fight. Certainly nothing that should frighten you if you’ve seen any action film recently. Since this is boxing, there are rules to the fights, which helps a lot. The fights feel real and have no cheap shots. My other big complaint with the film would certainly be the romance. It’s a textbook example of how you should not do a romance plot. It makes both characters look rather bad. Adonis hears some music coming from a downstairs apartment so he goes there to tell the occupant to keep it down. Turns out that the occupant is a girl who appears to either be rude or simply doesn’t realize that her music is super loud. Turns out that it’s partially the latter, but he has no way of knowing that. Doesn’t matter though since looks apparently do and he asks her out on a pseudo date almost immediately. He claims that it’s not a date and that they’re just friends, but I don’t think either one of them bought that for an instant. It’s a sad stereotype. After all, there are probably some guys and gals who just want to be friends, but you can never trust anyone who says that because 90% of the time, there are ulterior motives. Adonis clearly did not want to be friends from the get go even though he acted as if he was. They knew each other for a few minutes before effectively going out and then they show no restraint as we have some wince worthy romance scenes later on. You never saw this stuff in the original Rocky scenes! Still, romance aside, this was a good film. I still enjoyed it as I was watching and I could see it again easily enough so I’d say that it deserves to be in the positive side of the scale. As mentioned earlier, Rocky’s easily the best character in the film. The film did a good job of keeping his character true to himself and making Rocky defeat all of the other characters in verbal battles. I’m fine with his decision not to fix himself either since when I’m old, I won’t bother pulling out all the stops. Why prolong the inevitable if you’re super duper old? Of course, I’m sure our treatment plans will be better by then. If they are and there’s a high success rate, then I’ll go for it. If not, I’ll upload a final blog post about the end of my era. Adonis has some good qualities, but he was ultimately lacking as a character for me. Obviously, the romance played a large role in this. Aside from that, I just felt that he was a little unrealistic in how extreme he took his love for fighting. Ditching his super high paying job and mansion for a broken down apartment in a sketchy neighborhood so that he could fight a little? A love for fighting is great and I’m glad that he bet the car away since it showed some confidence, but he definitely did not need to quit his job. At least let them fire you if you show up with a lot of scrapes! Still, aside from the constant drama with Bianca, he was fine I suppose. In the next film, I hope they focus on his love for fighting and the drama can take a backseat. Bianca is about on par with Adonis, I’m not really a fan of hers either. Obviously she’s just too easy and ignoring the romance plot, it was a little rude to have the noise so loud. A less charitable neighbor could have filed some big complaints and gotten her into a lot of trouble. I’m also wondering if her hearing loss is going to be a big plot point in future films. Hopefully not though. She’s supportive at least. Conrad was the main villain and while they try to make him seem like a nice guy at the end…he seems pretty sketchy. There’s a reason why he’s going to jail after all, but at least he got to have one last fight. The ending of the film definitely isn’t very satisfying, but it’s how it goes I suppose. Even real boxing battles have anticlimactic endings like Floyd Money Mayweather and Manny. While I may not have been the biggest fan of this film, it was still a good one even if it sounded like there were more negatives than positive. The training scenes were a little more soulless than the original Rocky’s, but that’s because newer films can rarely grab that S rank soundtrack to help push things along. This one borrowed a tune or two, but for the most part it was definitely a step below in that regards. It was cool reliving the Rocky vs Creed fight on the big screen at the beginning of the movie of course and we even got an ESPN homage on the IPad. Those moments were definitely a blast and we also got to see that Rocky’s restaurant is still doing well. 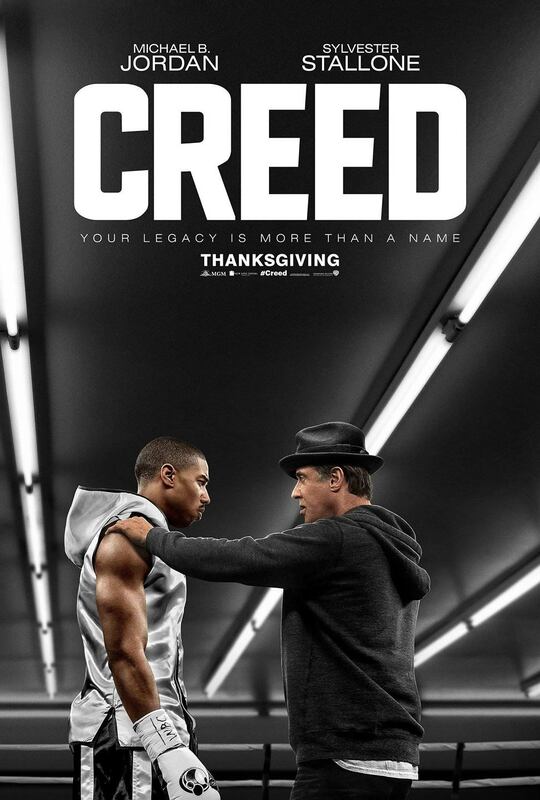 Overall, If you enjoyed the Rocky films, then I think that you will like Creed. It’s essentially a modern take on the franchise and has a lot of good fights. More drama than you may have expected, but that’s how it goes. The main way that the sequel can improve upon this one is with a better main cast and that could easily be achieved by introducing the President of the USA…as a fighter. That would be a very ambitious plot, but it can maybe be done. Give us a likable President like in Airforce One and we’ve got ourselves a solid sequel! It’s time to review the shaky camera film that came out not too long ago. It feels a whole lot older than 2012 though since I could have sworn that it’s been more than 3 years since we rented it. Ah well, memory doesn’t always go in a linear fashion and mine in particular has never been great. I don’t care for the camera style and there has never been a good movie that has used it (Sorry Cloverfield!). Still, maybe this will be the exception right?….. The plot involves Andrew Detmer as he decides to start recording his life on camera from now on. He gets bullied at school and he has no friends. At home, his Dad is always drunk so Andrew is really in a tough spot. It may not make for a good film to watch on tape when he grows up, but at least he’ll have proof for the cops. Did I mention that suspicious characters have practically formed a gang and taken over his neighborhood as well? One day, Andrew is called out by Steve to follow him and Matt into an underground tunnel. Andrew refuses every step of the way, but his body and his mind don’t seem to be on the same page as he dashes in. He reminds everyone that they shouldn’t be down there as they grab the crystal and are instantly defeated. When they wake up, the three heroes realize that they have advanced telekinesis. With this kind of power…they can do anything! Will they learn to use their powers for the good of humanity or will they decide to crush all of the obstacles that had been in their life? Well, I can’t say that this film was a winner for me anymore than Cloverfield. The shaky camera certainly doesn’t help and I don’t think that I will be converting into a fan in the foreseeable future. It just takes away from all of the scenes since you’re wondering how long the film will be until the camera goes away. A person was mugged at a bar for using the Google Glass in real life so imagine how much worse it would be for a kid who is already bullied to start bringing a camera with him to school? Only the plot allowed his camera to survive and the bullying actually gets a little worse once he starts using it. It also helps Andrew to withdraw from humanity along with the viewers. Andrew Detmer is the main character and he is part of the moral of the story. What’s the moral? It’s essentially that power corrupts and “what goes around comes around.” Andrew has been bullied by his family and schoolmates for a long time and once he obtains his powers, Andrew finally snaps. The thing is, Andrew had likely already snapped many times in the past, but he just couldn’t do anything about it without his powers. It’s one of the reasons why the gun control law debates are so fierce. There are many bar room brawls that escalate and if they had guns, I’m sure that we would get many reports of people being shot. Andrew wastes no time as he blows up a hole in a hospital and starts to rampage through the city. He goes from Hero to Zero (I love that Kingdom Hearts rhyme) or essentially from bullied kid to the deranged bully. I didn’t like him from the start and he’s just not my kind of film lead. It’s really why I didn’t like Peter Parker in the first installment of the reboot series. There are plenty of anime leads who start out quiet and sad like Aichi and Haruyuki, but they learn how to be sociable as they make friends. Andrew made two friends, but the camera prevents him from truly bonding with them. He is actually doing pretty well until his big incident at the party where he tries to prove that he is a man through romance. If great power won’t corrupt a person, romance certainly will. Did he really think that it would be a wise move to get intimate with a girl that he just met for 2 minutes? Andrew didn’t think it through and everyone would have walked all over him as they absorbed the money that he would earn with his abilities. His whole situation is pretty messed up and it’s very tough to get out of something like that, but he definitely didn’t handle it well. See, once you have great powers..then the situation should naturally get better. The main character can emit a barrier around himself with telekenesis so he doesn’t have to worry about his bullies or his Dad anymore. He doesn’t have to hurt them, he can just protect himself or freeze them in place for a minute or two so they understand their powerlessness. There are a lot of ways to improve the situation once you have such useful powers and Andrew made all of the wrong calls. It’s one of the reasons why he wasn’t really likable by the end. Matt is the main character’s cousin and he means well. He seems to put more of an effort into helping Andrew than the others, but it’s not easy. He can’t always be there so he doesn’t truly understand Andrew’s plight and it’s tough to really talk to the main character. Matt is also dealing with relationship troubles of his own at this point and he wants one of the girls to understand why he is so much cooler than everyone else. He doesn’t participate in the High School popularity stunts and he can be pretty arrogant. At the end of the film, it’s up to him to make the tough calls. He was possibly the nicest guy from the main three, but it’s still hard to find him likable. He has some good moments and then he also has some bad moments. He’s really just interested in romance when he talks to the main girl and that’s not cool. I never cared for the romance stereotype, but it’ll likely stay around for a while. Steve is the third member of the group and he’s the one who really links the three main characters. He involves both of them when they find the chunk of rock that gives them powers and he is pretty popular at school. His life is pretty perfect compared to the other two and he takes everything in stride. Of course, he does help the other two pull off some pretty mean spirited pranks and he’s also way too interested in romance and using his powers for pretty bad means. Yeah, Steve does beat Andrew, but he could still be a lot better. He looks pretty awful in his final moments though since he is basically sucker zapped. Richard is Andrew’s father and he’s really here as an obstacle to be overcome. His personality is just that he likes to get drunk and make Andrew’s life as miserable as he can. An accident made him quit his job and even though he has healed..he doesn’t bother to do anything with his life. He has no point in the story except to push Andrew over the edge. He says that Andrew is responsible for his mother’s final end because he was looking for Andrew to mess with him when the wife was dying. It’s the whole blame game and it doesn’t end. Richard really has nobody but himself to blame for everything that’s happened to him in the last few years. There is no real soundtrack so I’ll skip the audio section. (0/5 for the soundtrack by default…) The fight scenes are surprisingly good, which is probably the biggest plus of the film. Maybe it’s actually not too hard to do them and films typically just avoid these type of fight scenes for fear of reviews like in Man of Steel, but they’re very well done. We see the craters from the big clash and the telekinesis abilities are a little more refined than when Jean Grey used to fight in the X Men movies. (Granted..this is a 2012 film) The fight scene wasn’t totally satisfying since one of the fighters was trying not to fight while the other one was already pretty crazy, but I’ll take what I can get. You can definitely draw a lot of parallels to Superman in the way that they fought. Not a whole lot of punches are thrown, but they fly in Superman stances and the craters may remind you of the fight between Superman and Zod. It’s just a lot better than I would have expected for this film and it would have been even better with a different camera style. Overall, Chronicle makes most of the classic film mistakes. It has animal violence and no real themes. The main characters are not likable since they have many of the flaws that you see in everyday life. They just spam swear words through their daily life and just care about romance and being “cool.” It’s safe to say that the camera didn’t help either. 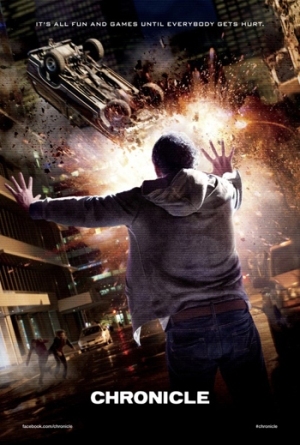 Chronicle did have some great action scenes though and a sequel could work out a lot better than this one if it follows Matt’s story and goes with a traditional camera view. That would give it a pretty good chance of not only beating this film, but perhaps doubling its score. That would be pretty impressive for a sequel! If you want to watch a shaky cam film then you’re out of luck as far as recommendations go since I wouldn’t recommend this one. However, if you want a film about people with super powers that isn’t Sky High, I would recommend checking out Naruto Shippuden Film 3!